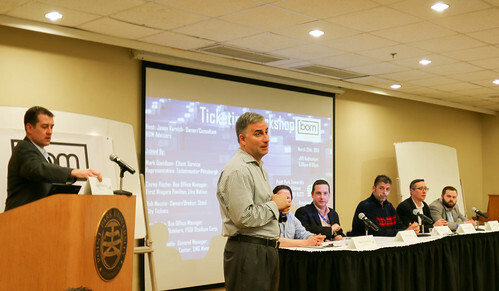 Students in Point Park's sports, arts and entertainment management program heard about trends in the ticketing industry at a workshop on campus March 25 featuring panelists who work for some of the most popular ticketing outlets and venues in Pittsburgh. SAEM adjunct instructor Jason Varnish, owner/consultant for BOM Advisers, organized the event. Varnish's company provides expertise in the field of box office ticketing as well as support within the event circle of operations, marketing and social media. Prior to BOM Advisors, he was the box office manager for the CONSOL Energy Center. Varnish teaches special topics courses in ticketing and box office management at Point Park. "Over the past three years, I've had various guest speakers come into my ticketing class. The conversations between the students and speakers were amazing so it made me think of how beneficial a workshop on this topic could be for the whole SAEM program," he explained. For SAEM senior Shannon McShane, the ability to connect with working professionals in the ticketing industry was the most beneficial part of the workshop. "The panelists were great. The workshop was super helpful and interesting because it showed that while the panelists are all in the same general industry, they do different things. I also learned that the ticketing industry has a lot involved with it," said McShane. "I plan to follow up with some of the panelists." "The workshop provided a rare opportunity for our students to network and interact with industry professionals who may be able to play a role in their future careers," remarked Varnish.